So I've come to the conclusion that I own entirely too much stuff and it's time to downsize. This is my set of Masterplots. I found this on sale at a friends of the library bookstore several years ago and it's been sitting on my various bookshelves ever since. For those who haven't heard of it, Masterplots is exactly what it sounds like it is: a set of reference books that summarizes the plots of hundreds of works of literature. I can vouch for the fact that it's a fantastic tool to use in question writing. It's a complete set; it includes all 15 volumes plus a series of annual updates spanning from 1964 to 1971. All of these books are in fantastic shape for their age. 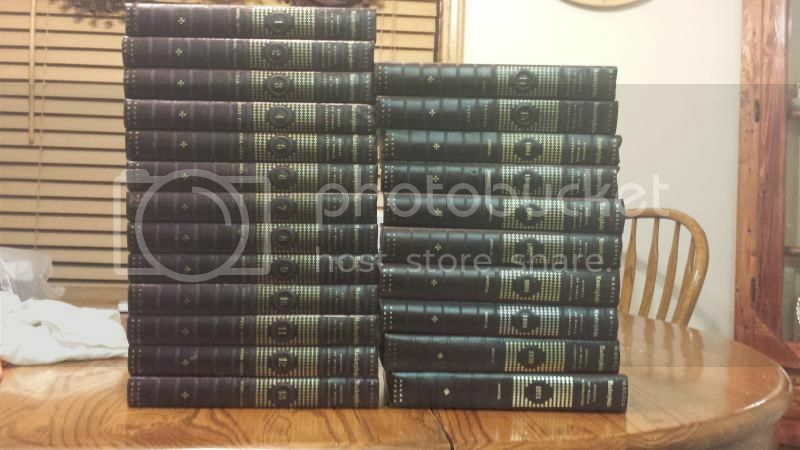 This set seems to be going on eBay for anywhere between $50 and $80, but I'd rather keep them in the quizbowl community if anyone is interested. I'd be willing to part with this for $40, plus the cost of shipping. Alternatively, I could deliver them to you the next time I see you at a tournament, but I really have no idea when that might be. I also have a huge collection of used fiction of the sort that works well to give away as prizes at tournaments. If anyone would be interested in buying some of these I could come up with a list of titles for you. I'm interested in the used fiction as well.